All three models can be purchased with a fan cooling the transformer. This option is important if you intend to seal in a fast rhythm for a long period, in order to avoid overheating of the transformer. If your sealing rhythm is more relaxed you won't need the fan. 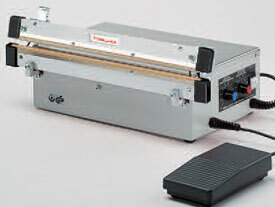 The Magneta MGM sealer is powered by an electrical motor and equipped with an electrical foot switch. This special system enables you to close the sealing jaws with a gentle push on the pedal and achieves consistent and reliable seals. More accessories upon request available! with thermal impulse process, for films up to 2 x 0.4 mm. Double-side sealing, infinitely adjustable automatic cooling and sealing times, constant pressure due to holding electromagnets, incl. foot switch. TÜV- and GS-certification, CE-certification.More accessories on request. 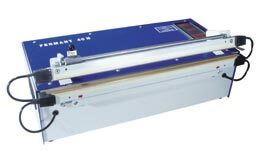 with thermal impulse process, for films up to 2 x 0,4 mm. Double-side sealing, continuously adjustable automatic cooling and sealing times, sealing jaws pressure with electromagnets, incl. foot switch. Easy to handle. The continous adjustment of the pulse and pressing time allows optimum adjustment to the type of film used in each case. Easy to handle. 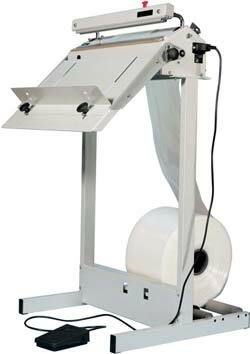 The continous adjustment of the pulse and pressing time allows optimum adjustment to the type of film used in each case. All sealing parameters can be controlled. An interface allows the connection to a PC, a software for analysing the sealing process is included.